Counter canter basically means cantering on the ‘wrong’ leg. Initially, you are only asked to show a small amount of counter canter on a straight line. However, as you progress up through the levels, you will be expected to show more counter canter, some of which is executed around a curve. 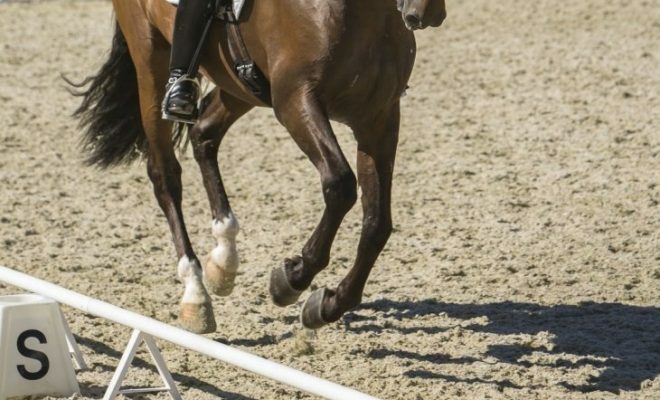 So, what’s the point of asking your horse to canter on the wrong lead, and how do you ride the counter canter correctly? Counter canter is the regular 3-beat canter on the outside lead. For example, if the horse is on the right rein, then the horse would be going in the direction right, but the canter would be leading with the left foreleg. The value of the counter canter lies in its suppling, engaging and collecting effects. 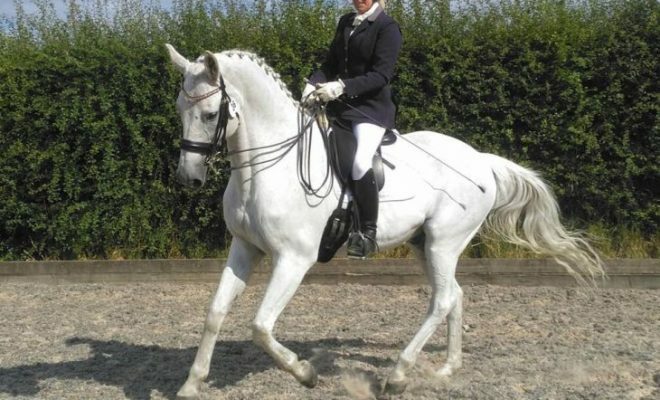 The rider can start asking for counter canter when the working canter feels in balance and they feel that their horse is bringing them into a deeper seat whilst cantering. 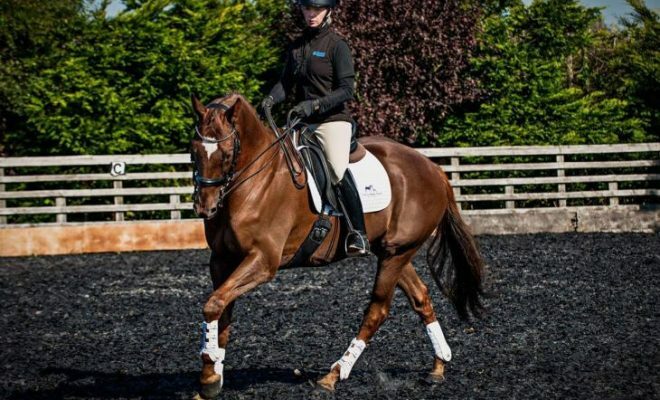 If the canter feels hurried, or the rider feels that she has too much in the hands, then it would first be wise to make the ‘normal’ working canter more balanced towards the hind legs, through the use of repetitive transitions. If the horse can balance towards the hindquarters whilst performing a walk to canter transition from subtle aids in either direction, then the horse is ready to start with counter canter. 1. Ride on a ‘named’ canter lead in the middle of the arena, independently from the track, trotting before turning. 2. Ride on the right rein in trot and make a loop in from the track; midway through the loop as the horse to transition into canter left. Make a downward transition to trot before the corner. Repeat until the whole loop in canter; then make the loop shallower, until the horse maintains the balance on the long side. 3. On a long side, change the canter lead via some trot steps; repeat until the horse waits for subtle aids and stays in balance. 4. Ride on the long side in counter canter and maintain through a rounded off corner. Ride through a second rounded off corner and straight onto a diagonal line to change the rein back into true canter. The rider must take care to maintain good riding posture while staying weighted onto the seat bone on the side of the leading foreleg, which is on the ‘inside’. The horse’s outside legs, and the rider’s outside leg are nearest to the inside of the arena. As in true canter, the rider’s outside leg is positioned slightly behind the girth area to protect the hindquarters from swinging out. Just as the rider’s outside leg stays behind the girth, the horse may need support into the same outside rein. The inside rein can ask for a little flexion to the leading leg, but no more than would be asked for in true canter. You should not get carried away and ride too much counter canter all at once. It is a good idea to intersperse the counter canter with some trot and true canter to revisit the impulsion and to enable you to feel the thoroughness and carriage building. All the exercises described previously will develop and improve the horse’s balance and coordination for a more collected frame. As the balance develops, the exercises can be made more demanding, but it is the rider’s responsibility to feel and gauge what the horse is able to do, so that the work and understanding improve. 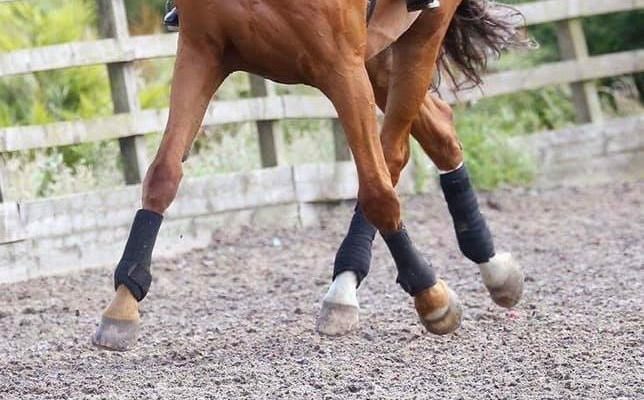 Counter canter can be confusing for both horse and rider, so it is important to introduce it gradually once the ‘true’ canter is sufficiently balanced and secure. Once mastered, counter canter is a very useful suppling exercise. 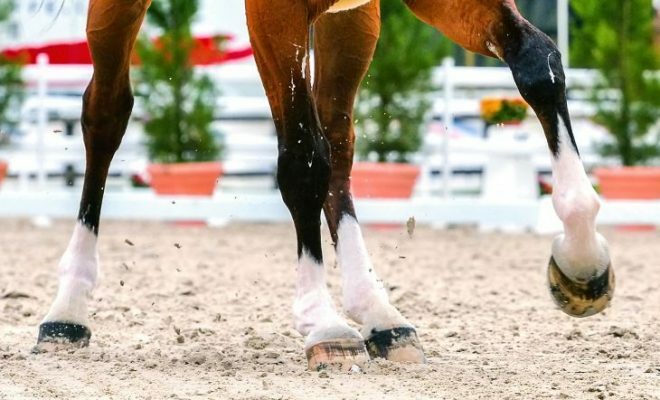 Use the helpful guide above to teach your horse counter canter to gain good marks in your dressage competitions, and also to improve his canterwork.